Hotel safes is a generic name for a number of low grade safes that are perfectly designed for use in the hotel trade. A large number are also bought for use in the home. The normal characteristic of these safes is that you decide the combination each time you lock the safe. This hotel safe allows the user to use either their credit card or a typed in combination to open and lock the safe. Safecracker were called when the owner of this hotel safe forgot the combination they had keyed into lock and were now unable to unlock this hotel safe. Safecracker were quickly able to open this hotel safe with no damage what so ever allowing it to be put back in to full use. 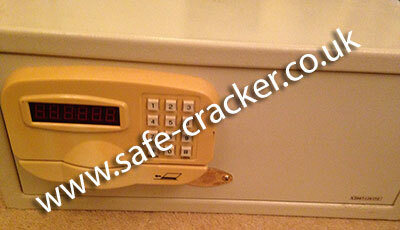 If you have a hotel safe that you are unable to open, just call safecracker. When the owner of this Phoenix safe forgot the combination, she telephoned four local locksmiths who advertised a safe opening service. One locksmith shop asked if she could break it off the wall and take it in to them and another wanted £60 to attend and look at it, just to see if he could open it!! Luckily she didn't fall for any of those scams and eventually she found Safecracker. One call to safecracker and we confirmed that we could open it and one text photo of the safe, confirmed the exact price. 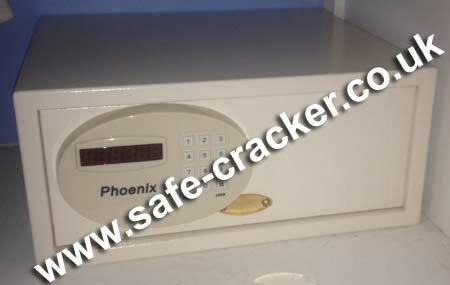 The next morning we attended, opened the safe with no damage and put this Phoenix safe back in to full use. If you need a Phoenix or any other safe opening, call Safecracker. When the owner of this SMP Digilock safe which is also referred to as an SMP mini hotel safe was unable to open the safe with either the correct combination or the over ride key he telephoned Safecracker. We attended and opened the this SMP Digilock hotel safe. 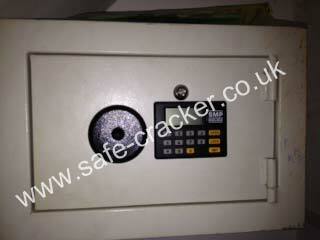 If you need an SMP Digilock safe or SMP mini hotel safe opened please call safe cracker.